Replacement: DEV-09712. 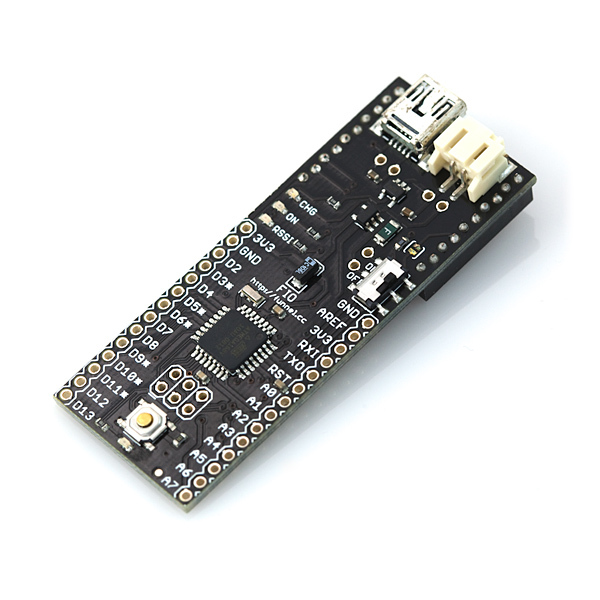 This product has been replaced by the improved Arduino Fio. This page is maintained for historical purposes only. Funnel](http://funnel.cc/) is a toolkit to sketch your idea physically, and consists of software libraries and hardware. By using Funnel, the user can interface to sensors and/or actuators with various programming languages such as ActionScript 3, Processing, and Ruby. FIO is compatible with Funnel. 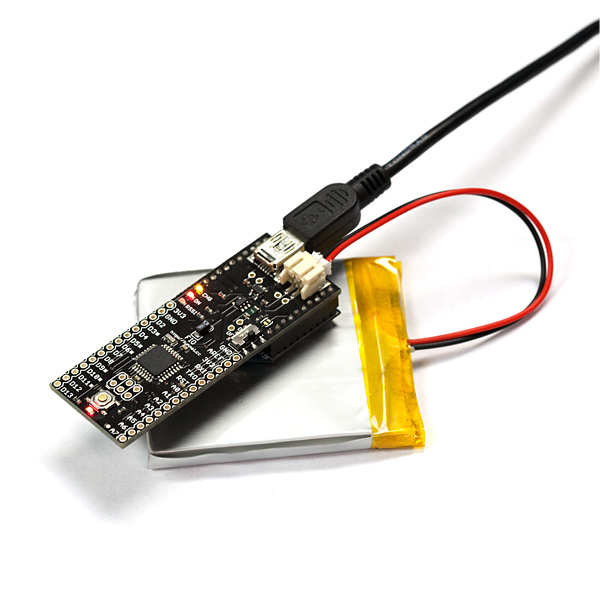 It has connections for a Lithium Polymer battery and includes a charge circuit over USB. An XBee socket is available on the bottom of the board. The FIO has been designed to be wirelessly reprogrammable. Checkout our tutorial on wireless bootloading! If you solder some right angle pins on the funnel, you can plug in the FTDI right on to it. You can not use the usb onboard for anything except power, and charging of a battery. Thanks for taking the time to show that. I was looking for this information exactly! "Did you consider including (or did you) a six-pin header (possibly unmounted) to allow the board to be programmed using an FTDI cable? That would lower the cost needed to start loading sketches onto the board." "Yes. Please look at the right side (actually top side in the picture). 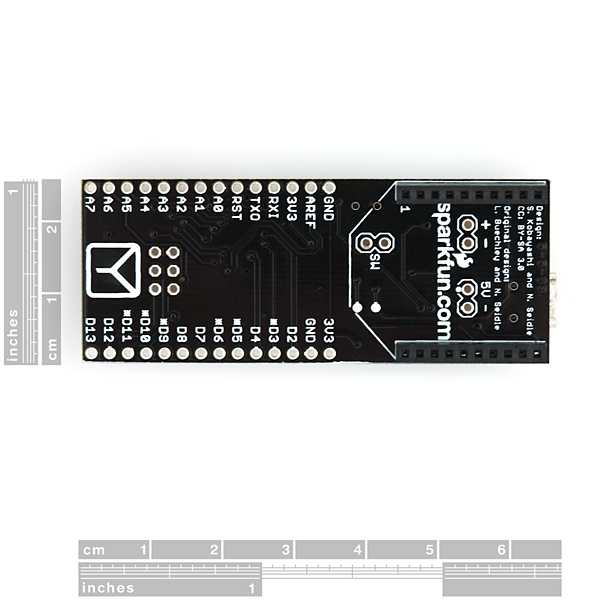 The first six pins are compatible with SparkFun's FTDI Basic Breakout modules, so also compatible with FTDI's." Dimensions are on the photos. You can tell the rough size from that. Strongly recommend you check out my Wireless Bootloader discussion for series 2 / zigbee. Does anyone happen to have the bootloader source? I've looked and looked and can't find it anywhere. I'd rather not reprogram the bootloader if I can figure out wth the current bootloader is trying to do. 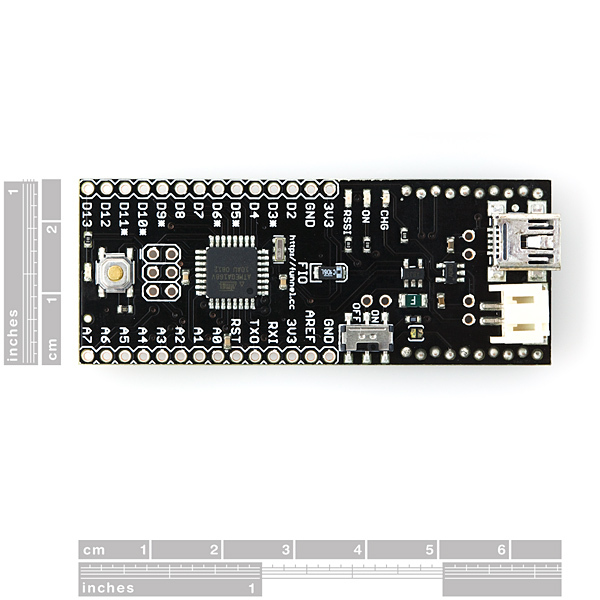 I was reading the setup instructions at http://funnel.cc/Hardware/FIO?userlang=en and at the end of the page it says we have to solder a jumper on the FIO board and another one on the XBee Xplorer USB board. Why is that? Will it make the XBee Xplorer only work with the FIO if I do that? Would it work without soldering these jumpers, I mean... is it necessary? There's not much explanation in the funnel website and I would like to know what is that for. OK, I did a bit more looking. This has to do with a technique called line passing in the old xbee firmware that mirrors the dio3 value. The rts input is used to set dio3 this cheesy way. Seems like it would be more robust to just send an At command to get the remote xbee to flip the dio3 line. In 2.5 I guess you can use digital change detect but who wants to change the firmware for each destination device? This seems ? (1) the solder bridge on the funnel is to connect dio3 of the xbee to the reset switch on the atmega. I assume that just provides a wireless remote reset and makes good sense. (2) the solder bridge on the usb explorer connects the more or less unused dtr line from the usb to the dio3 line of the xbee. It makes no sense at all that I can figure since the explorer is being used as a controller. You can send whatever packets you want from the usb line. I'd love an answer to this. make sure you take the Xbee out of the socket first! I am using Funnel I/O remixed, which is an awesome revision of this board. It looks to me that this version FIO can probably be programmed via that breakout also, using gnd, 3v3, rxi, txo, and rst pins. 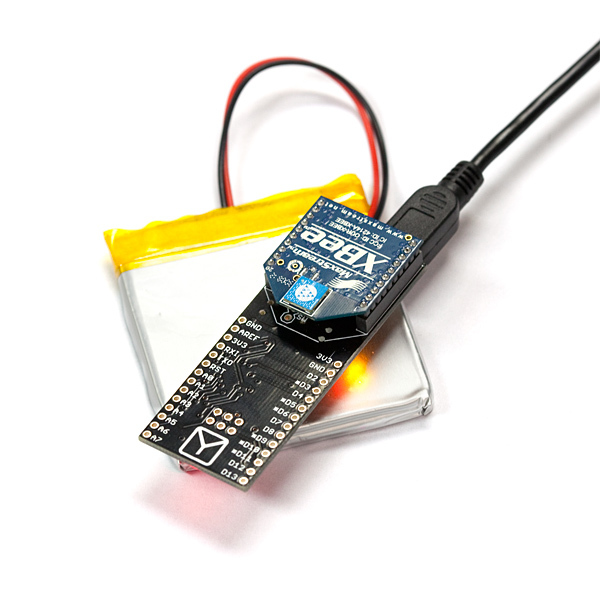 It would be really useful to have the XBee sleep pin and perhaps CTS brought out, even just a new revision with a connector as you did for the VIN/battery would be fantastic. Thank you very much for your suggestion. Do you mean pin #9 and #12? I would love to see some more space in it (328). Also, I don t see the purpose of having a power only usb plug. Either remove it altogether and allow the usage of FTDI for both power/charging and communication (like with pro), or incorporate the FTDI on the board. These could be excellent All-in-one boards for tighly packed projects. I will surely consider one for my project if it comes out in 328. Also I wanted you to please clarify something. Does it work with Xbee 2.5? Someone above said that it does not. Is this true? Yes, the Series 2/2.5/ZB/Zigbee modules are pin and power compatible with the Series 1/802.15.4 modules and will work fine in the FIO. Anyone know if this product will be updated to the new ATmega328 chip? I love this little setup, but would love a little more space for more advanced programs. I'd like to be able to charge it through an external 5v source, but it looks like the 5V usb pin goes to the charger's DC in and the USB charging pin is left unconnected. Isn't this going to draw more than USB is spec'd for? Is there any chance a future board rev is going to make a trace for a DC charging input? This board looks very interesting, and could be perfect for one of my projects. I've seen in the specs that it takes the XBee-PRO modules - but does this include the 900Mhz modules? I'm assuming not, as it looks to only take 802.15.4 modules, but I thought I'd ask the professionals. Just got one of these, very, very nice. One question: Pin 15 of the XBee connector ("OTO5") seems to have been blocked off by something that looks like a pin. This prevents my XBee modules from plugging in. Is this intentional, e.g. for polarizing the XBee, or is this just an assembly feature? I can cut off the XBee pin to make the module fit. Is that likely to cause a problem? It shouldn't be like that. I have 5 of them, and none of them required me to cut a pin, or anything like that. My apologies! That sounds like a pin got soldered for too long. The XBee sockets like to pull solder into the wrong places if the person doing the soldering solders for too long. Sounds like you've got a very good fix but if you need a replacement, please let us know. It would be nice if a future board rev provides easier access to the "USB VIN". In my application -- http://emergent.unpy.net/01233419381 -- I wanted to run FIO and blinkm from the same 5V regulated power supply. I ended up soldering a wire from pin 4 of U1 to the blinkm which works fine, but a spot for a standard pin header would have made this even easier. Great suggestion. We've added a 0.1" spaced connector just behind the USB connector and battery connector on the latest rev, should hit the general population soon. So the FTDI Breakout works for programming this board. That's pretty cool. Does anyone know if the built in USB port works for establishing a serial connection to a computer? If NOT, can I use the FTDI breakout for a wired serial connection or is there something else I have to do? 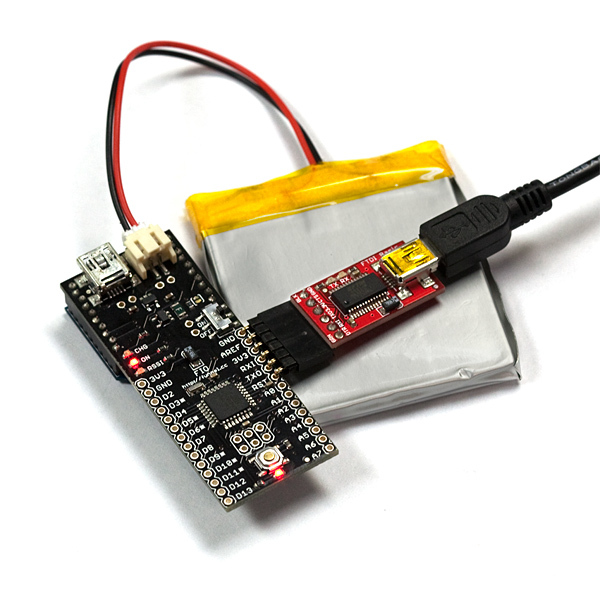 Judging from Widefido's comments, you can't use the USB port as a serial connection, but you can use an FTDI cable or breakout board to connect to certain pins on the board. Thanks for the tip. I'll retract my statement that the board has to be programmed wirelessly. You do still, however, need extra hardware to program the board, i.e., either the FTDI cable, or the FTDI breakout board. I understand that most of the devs out there have these devices, but it should still be clear that you are unable to program this board over usb like the Duemilanove/Decimilla. I just received my funnel board, and I have to say this thing looks great. 2) It is incredibly difficult to get this working with the ZNet 2.5 XBee module firmware due to the lack of I/O Line passing. The Series 1 firmware is essential for the wireless programming without having to manually press the reset button on the board. These two items aren't killers, I just wish I had known about them before I shelled out $24 for it. Judging from the schematic, it looks like USB power feeds the battery leads and the board, meaning it should be able to charge the battery and power the board simultaneously. Is this true? Also, would this work with XBee Pro boards? You should think about moving the TX and RX lines from the Xbee socket to pins 2&3 of the Atmega168, so a person can access the serial port and transmit commands at the same time. This is very useful when trouble shooting. Ladyada's softserial will allow pins 2&3 to act like TX and RX. What is the system voltage? I'll presume a single LiPo means it's a 3.3 board?